Antonio Brown is in Oakland now, but that did not stop him from taking another jab at one of his former Pittsburgh Steelers team-mates. The feud started when Brown wrote Sunday on Twitter: "Keep your emotions off the internet," which prompted a response from multiple fans. 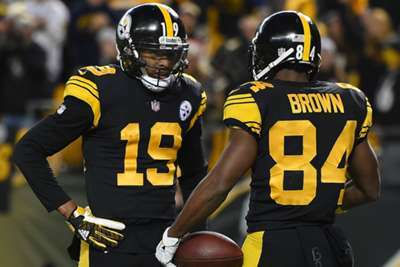 Brown replied to one post in particular in which a fan shared a photo of receiver JuJu Smith-Schuster, reminding Brown that his former team-mate was named the Steelers' Most Valuable Player for the 2018 season. Brown wrote, in part: "Emotion: boy fumbled the whole postseason in the biggest game of year! Everyone went blind to busy making guys famous not enough reality these days! by the way check the list." Of course, Smith-Schuster caught wind of Brown's response and mocked the new Raider by sharing his own message: "Keep your emotions off the internet." This only adds more fuel to the reports that surfaced in January, indicating Brown's frustration with the Steelers - which eventually led to his trade to the Raiders - was sparked because he was not voted MVP.